The newest piece of jewelry to the "My Favorite Bloggers" collection --- The Gridiron Lipstick Bracelet! 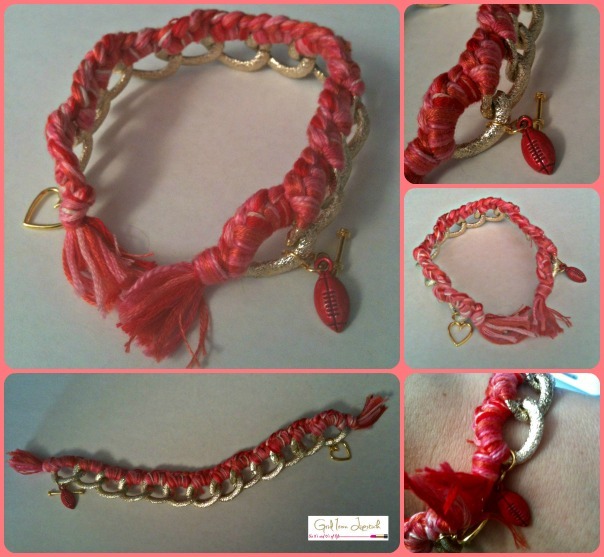 This beauty is a textured golden link bracelet that has many shades of coral-orange and coral-pink braided throughout. See, Kait's favorite color is coral, so I just had to make a bracelet that encompassed that. Kait also is a big fan of gold - hence those gorgeous golden links. And, as a nod to her blog, Gridiron Lipstick, there is a tiny football charm attached near the toggle clasp that has been hand painted in a bright, shiny coral pink. This bracelet can be found via my Etsy shop or my clicking here.